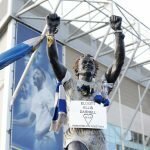 Leeds United boss Neil Warnock said he thought his side deserved to win after knocking Premier League side Everton out of the Capital One League Cup at Elland Road. Leeds went ahead when Aidy White cut through the Everton defence inside five minutes to score his first goal for the club. Everton failed to muster a shot on target in the first half and Leeds could quite easily have gone in further ahead when Luciano Becchio saw his header cleared off the line in the closing stages of the half. Leeds doubled their lead halfway through the second half when Rodolph Austin got a faint touch to a Danny Pugh shot and despite Sylvain Distin pulling a goal back for Everton with ten minutes remaining, Leeds held on for the win.